Who wouldn’t want a closet full with all these outrageously expensive shoes? Have a look at the once every collector want’s to own. While most man complains about their wives taking up too much closet space with their shoes, man is stepping up to this trend too. Both genders are spending more and more money on shoes and where there is a demand, the market will supply. In this article, you will read about the 20 most expensive shoes made to this day. If you wonder what the rich and famous wear, this might give you a pretty good idea. Looking as shiny as a chocolate Easter egg, this shoes will have you dripping in gold instead of chocolate. Which in my opinion isn’t all that bad either, but you know….chocolate. Anyways to get back on point, these customized Nike Dunk High are dipped in 24-carat gold and designed by Kenneth Courtney. 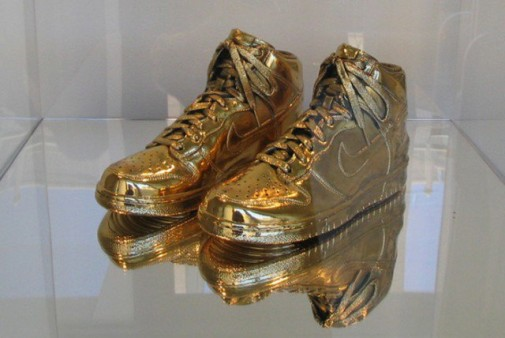 They were a part of the Nike Limited Edition 24 Carat Gold shoes.